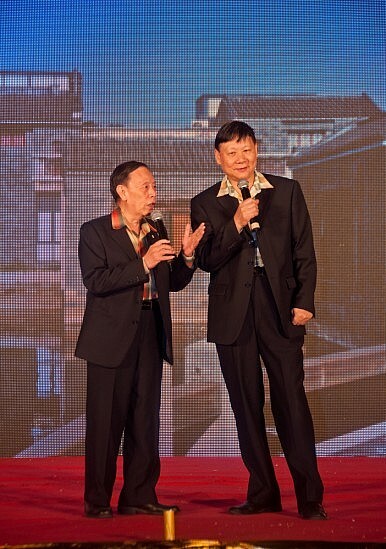 A crosstalk performance by Huang Junying and He Baowen in 2012. Can foreign-style stand-up comedy gain ground in China? The question may strike some as odd. Skimming through Chinese talk shows, one would find laughter and gags abound from both the hosts and guests. But as the NYT points out, stand-up comedy is a completely different beast — and one that is facing significant hurdles as it tries to establish its ground in China. Stand-up barely existed in China until a few years ago, the closest comedic art form being crosstalk, a rapid fire dialogue between two performers that has its roots in street performances of China’s dynastic past. But the growing loss in popularity of this ancient form has carved out space for something else to take its place. And foreigners seem most eager to fill this gap. China enthusiasts like Canadian freelance performer Mark Rowswell and American entrepreneur Jesse Appell are among the key North Americans who have taken the helm. Both Rowswell and Appell came to China originally on scholarships and started out by learning the ropes of crosstalk. Rowswell, or Dashan as he’s more popularly known, made his fame through performing crosstalk in state-sponsored settings like the annual Chinese New Year Gala. Appell, arriving almost two decades later, experimented with a variety of comedic forms, including crosstalk, before finally bringing his eclectic experience into an intercultural comedy project known as LaughBeijing. They’ve both since moved away from crosstalk, noting its decline in popularity, and are expending their comedic efforts in the best way they know how: stand-up. While the appetite for comedy is growing in China, there are cultural roots that prevent forms like stand-up from being successful. At the most fundamental level, people don’t understand the mechanisms that make stand-up work. Stand-up relies on discomfort, but as long-time educator and scholar of Chinese comedy David Moser explains, the Chinese “weren’t raised on satire, so it just [sounds] mean and weird.” Introducing stand-up to a Chinese is essentially like introducing a lifetime vegetarian to meat for the first time. There’s a brick wall to be met externally as well: state censorship. Part of the difficulty faced by comedians is that it’s pretty vague what can be said and what cannot be said — beyond the obvious taboo of the three Ts (Taiwan, Tibet, and Tiananmen). That’s the power of censorship: Keep the rules vague, and let everyone police themselves. While this censorship largely exists at high levels such as television broadcasts, its existence means that stand-up comedians will find it hard to promote to the masses and draw in those who don’t already actively seek them out. And the Chinese government has in several instances closed down gatherings that they feared would ruffle too many feathers. At the end of the day the “gap” that foreign comedians aim to fill doesn’t really exist — they are in fact creating space for themselves. Rowswell says that after twenty years of being “stuck in a time warp” he wants to start something innovative. Appell wants to create a new way for people from both cultures to find a common ground for laughter. And despite all the systemic constraints, the future of stand-up isn’t without legs. The older crowd may prefer to stick with traditional sources, but millennials — especially those with some access to Western media sources — are catching on. For the young, it’s the opportunity for candid self-expression that reels them in. Stand-up provides a forum for the performer to reflect on social problems, build confidence through laughter, and have their voice heard outside the controlled, multiparty settings of other platforms. In the booming metropolises of China, there is fertile ground for change. Shanghai is slowly building a name for itself on the international comedy circuit, and over half a dozen comedy clubs have sprung up around the country. And there are so many ways it could go in the long run. Stand-up could simply become a platform to mitigate Western-Chinese misunderstanding. It could become, as many stand-up pioneers have romantically idealized, a wholly Chinese outlet for the younger generation to speak out in a background of censorship and communitarianism. It may ultimately become another one of those Western exports that the Chinese transform into something completely their own (famous Chinese comedian Zhou Libo is adamant that his style is distinctly not stand-up). Or, it could just remain as it is currently: a light-hearted means for Chinese expats and bourgeoisie to question their homeland from the outside. Exploring hybrid concepts in the Beijing food and beverage space.